Music, Politics and Murder in Hebron. 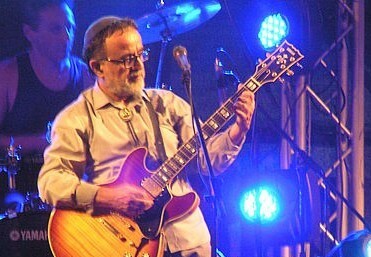 Ehud Banai, aged 60, is an important Israeli singer and songwriter. Born of the aristocratic Jerusalem Banai family he has recently become more religious, or traditional as it is often called in Israel. Despite this spiritual shift his political views are still generally considered to be left of centre. This Succot, the Jewish festival of Tabernacles, Banai initially agreed to appear in the Judean settlement of Susya in South Hebron, but due to pressure from the Israeli left announced that he would cancel. However, after pressure from the Israeli right he finally announced that he would sing at Susya afterall. I’m no great lover of music and rarely attend such gatherings, but on Sunday night I decided to attend. I wanted the concert to be a success and I reasoned that if any rowdy right wingers were to boo or heckle Banai, I’d be just the man to shut them up. More importantly my daughter Rachelle is serving five minutes from Susya as part of her officers’ course and it would be a chance to bring her some home-cooked food and meet her friends. My sister, who lives ten minutes from Susya, invited us for a barbeque lunch in between seeing Rachelle and going to the concert. All in all, it seemed too good an opportunity to miss. So, late Sunday morning we set off southwards. We were pleased to see Rachelle. She told us that left wing demonstrators had been protesting near to the tiny settlement in which they were stationed. Apparently, the IDF’s main worry was what hot-headed settlers might do to these poor European anarchists. Over lunch nobody spoke about politics. Truthfully, everything there is to say has been said so many times. Instead, it was all about family matters, gossip and advice for my niece who soon leaves for three years in Italy as an Israeli emissary and teacher. Her sister, who has waited for a child for nine years and has known so many disappointments, was there looking delightfully fat and pregnant. Please G-d. It is now 7.15pm and we enter Susya. Shouts of “Free Palestine!” greet us and upset the festive atmosphere. I have heard something similar many times on clips on this excellent blog, but never live. They seem to be out of tune chanting “Free Pales-tine!” rather than the usual and much more melodious “Free Free Pal-es-tine!”. Every fibre of my being wants to stop the car, get out and ask them why in this sea of madness that we call the Middle East the focus of their protests were always against this one tiny island of sanity, democracy and human rights. “Maybe I’d ask them why they don’t drive another 150 miles north and demonstrate against genocide” I replied. Ariel is right. There is very little point in trying to persuade those who believe in the concept of a “Higher Truth”. You can argue yourselves blue in the face citing historical facts, international law and just common sense, but they’ll just wait for you to finish and then repeat yet another tired cliché about apartheid or colonialism or worse. And, anyway, the IDF were desperately putting every effort into protecting those wretched anarchists and wouldn’t have let me near them. 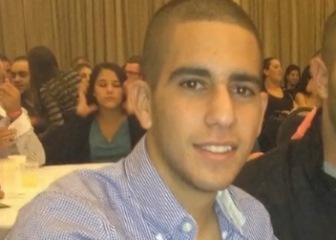 Gal Kobi who was killed by a Palestinian sniper. We arrive at the outdoor concert area after stopping briefly to taste some excellent, but over-priced Hebron wine. It has a similar taste to the Palestinian grapes that we purchased along the way. There are no seats though the wise have brought plastic chairs with them. We are about a dozen sharing two small blankets that do little to protect us from the sharp pebbles. There are to be two singers, Boaz Sharabi and Banai. Sharabi and the organizers also seem worried that members of the audience might boo or heckle Banai because of his original cancellation. Sharabi inserts into his impressive performance a moving plea to receive his friend warmly. In the event there is little to worry about as the feast of tabernacles is traditionally a time of joy and Banai is cheered. I may be there for political reasons, but clearly most are just out to have a good time, and who can blame them? On the way home we hear that a Palestinian sniper has shot and killed a soldier in Hebron. Roxana, my wife, is worried that it might be one of Rachelle’s brothers in arms. However, it transpires that it was 20-year-old Gal (Gabriel) Kobi who served in another unit. There is no reason to feel relief. Gal’s blood was no less red than the soldiers who are serving with Rachelle and he too had friends and family who loved him. He was a complete world and had plans and dreams and a potential that will never be realized because of the bullet of a coward with a sniper’s rifle. And that is the truth. Perhaps that is what I should have told those anarchists. Daniel Marks, a teacher, lives in Ma’ale Adumim on the West Bank. The “Jewish community” comes under attack at Amnesty. The UN’s Hamed Qawasmeh (right) next to the chairperson at Amnesty in London on Monday. It didn’t take too long for yet another anti-Israel event at Amnesty International to spill over into criticism of Jews. 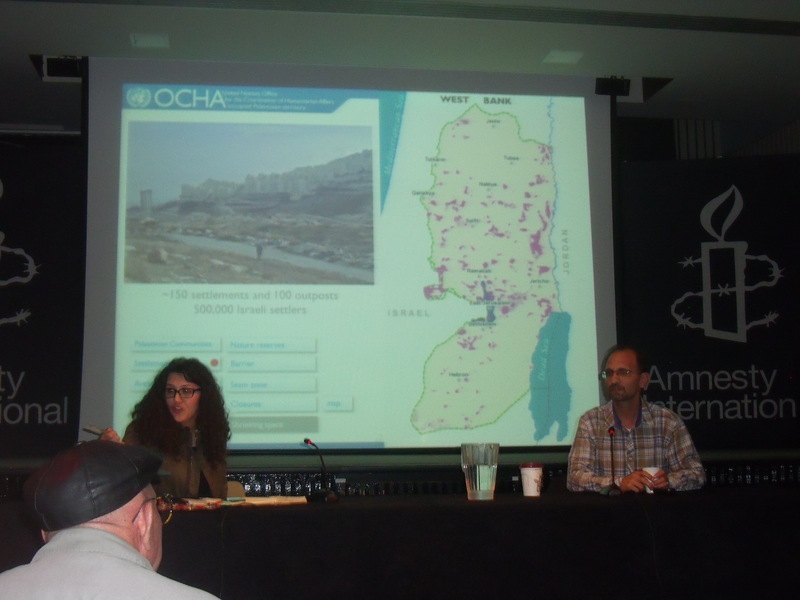 It was Monday night and Hamed Qawasmeh had finished speaking on the subject of Human Rights in Hebron and Area C of the West Bank. Qawasmeh is a long time employee of the United Nations and his current remit is to “document human rights violations in the southern West Bank” (apparently human rights violations don’t extend as far as the recent cold-blooded murders of two Israeli soldiers in the West Bank, one in Hebron itself. Neither murder was mentioned during the event). Qawasmeh described how Israel uses its control of Area C (granted to Israel under the Oslo Accords) to ethnically cleanse the Palestinians. It does this, he said, by refusing to grant building permits, by demolishing Palestinian homes, by evictions and by building military zones and nature reserves so as to confiscate more land. Then there are the roadblocks, checkpoints and “separation wall”. He claimed the Israeli government refuses to allow Israeli electricity companies to build electricity pylons for Palestinian homes near Jewish settlements. Quite magnanimously, Qawasmeh did say that he had no problem with Israel wanting to protect its own people by building the wall, but that the wall should stick to the “1967 border” and not snake into the West Bank. During the Q&A I stated that “settlements” are not illegal and that the so-called “1967 border” was not a border but merely an armistice line. I also said that when visiting Hebron twice I had seen many palatial Palestinian-owned houses en route. I had intended to go on to ask how there could be any peace while Palestinian Authority television shows Palestinian children saying they want to become “martyrs” and with the Hamas calling for the murder of Jews via their Charter. But by then the audience was getting restless and vocal and the chairperson was telling me I had taken up enough time. I tried to persist with my question but it got lost in a noise of insults. Meanwhile, a woman from the audience approached me and held my arm while asking me to leave the room with her. I slumped back into my chair and stayed silent as the discussion moved onto how Israeli settlers throw stones at Palestinian children on their way to school and how Israel rounds up large numbers of Palestinian “kids” and tortures them under interrogation. This seemed to be a totally unprovoked attack on “the Jewish community”. But instead of being criticised for such an outburst Qawasmeh assured Hayeem that he gives his presentation to Israelis and also to “Jews who come from the States”. On leaving the room at the end of the event I was confronted by a young woman who told me that her grandmother, who was a Holocaust survivor, would be ashamed of my behaviour. Someone else told me that she had no problem with Hamas. I was also twice told that my manner was too aggressive and that I was “not helping my own cause”. Overlooking these shenanigans was Amnesty’s campaigns manager Kristyan Benedict. Benedict once tweeted “Louise Ellman, Robert Halfon and Luciana Berger walk into a bar…each orders a round of B52s … #Gaza”. The three MPs happen to be Jewish. He also once threatened to beat me up after another Amnesty event, again after I had questioned what I had heard. According to the Jewish Chronicle Benedict was forced to apologise for his tweet and Amnesty said that he would “focus his energy on managing AIUK’s crisis work, particularly the human rights crisis in Syria”. But on Tuesday night he wasn’t focusing on Syria. He was at this disgusting anti-Israel event, albeit not chairing it for once. Old habits obviously die hard.